Male friends and acquaintances frequently ask me which are the best men’s watches? Obviously, tastes vary significantly from person to person, so it is a really hard question to answer. Many experts would consider watchmakers like Patek Philippe, Vacheron Constantin and Jaeger Le Coultre to be amongst the finest. However outside the world of horology, most people would aspire to own a timepiece by Rolex. Ultimately it all comes down to budget because that will have a bearing on the quality of materials used and the mechanical movement powering the watch. Here are four extremely well-made timepieces that have an enormous amount of design merit. 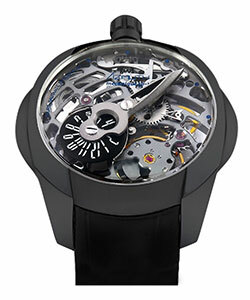 Recently Azimuth has been selected by the Watches Art Gallery in Geneva to exhibit one of their watches. This is an enormous honour because most of the other brands, including Rebellion, Audemars Piguet and Christophe Claret to name just a few, are really high end. The timepiece in question is the stylish and affordable SP 1 Spaceship Predator. Dimensionally this watch has a generously proportioned 45mm 316L stainless steel case; black PVD treated. What makes this watch so appealing is the skillfully decorated Côtes de Genève skeleton dial. Beneath the contemporary façade lies a manual winding Swiss Unitas ETA 6497 movement. Get the SP 1 Spaceship Predator here. When it comes to innovative design B.R.M really is at the cutting edge. Over the last few years, this French watchmaker has produced some exceptional timepieces at all price points. The CT-48-AJ is one of their larger and more exclusive models. With a titanium/stainless steel case measuring 48mm, the watch is sure to make a bold statement. What makes this timepiece so enticing is the multi-layered skeleton dial with carbon fibre triangles. 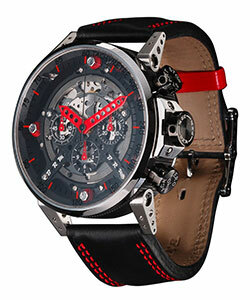 Other features include intricate drilled lugs, lightweight red hour/minute hands and sporty sub counters. At the heart of the watch is a modified ETA Valjoux 7753 mechanical self-winding chronograph movement. 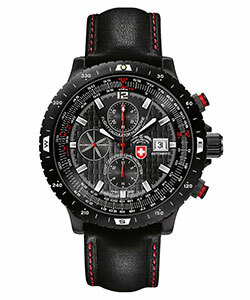 CX Swiss Military offer consumers quality watches at reasonable prices. All their timepieces are manufactured in Switzerland to the highest specifications. The Hurricane is a well-priced Pilot watch that pays tribute to the iconic aircraft used by the RAF in the Battle of Britain. This timepiece has extra large 316L stainless steel case measuring 47mm x 17mm. What makes this watch so distinctive is the stylish silver dial with contrasting black chronograph sub counters. Other features include a rotating bezel (with flight calculator), Incabloc shock absorber and black leather strap. Powering the watch is a COSC chronometer-certified automatic 25-jewel Valjoux ETA 7750 mechanical movement. 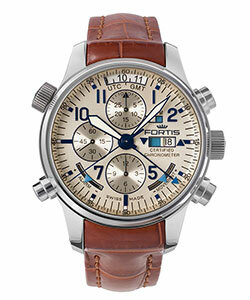 Fortis has produced exquisite watches for over a century. Impressively, the company has remained independent in that time and is located in Grenchen, Switzerland. One of their most exclusive and stylish models is the Daybreaker Recon. This watch was designed to commemorate the company’s 100th anniversary. Dimensionally the watch displays classical proportions and has a case measuring 43mm. What makes this timepiece so extraordinary is the meticulous gold engraved dial. This characteristic displays a plethora of functions including GMT/date indications, chronograph timers and alarm. Beneath the refined exterior lies a Swiss made self-winding twin barrel mechanical movement. Get the Daybreaker Recon here. Find the watch that's best for you, check out our full range of watches.